Just a mere 24 hours until our LIVE from Chicago “Summer Staples” Posh Party and we couldn’t be more excited! 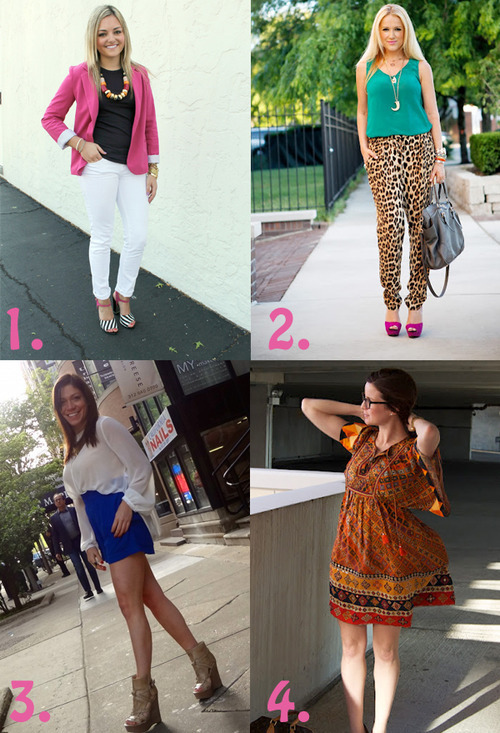 What better way to get you in the mood than to highlight a few fashionable looks from our amazing co-hosts! 1. Jessica of Bows and Sequins: Black and white is such a classic combination and when you add in a fun blazer, amazing statement necklace, and striped shoes it is a match made in fashion heaven! There’s also is an added bonus: Jessica is selling these shoes on Poshmark! Get em while their hot! 2. Helen of Hel Del Chic: How fierce are these leopard print pants? With pops of colors in the shoes and top, we don’t think it could get any better. One word: MEOW! 3. Hallie of Corals and Cognacs: Shorts for summer? Yes. Blue, high-waisted, silk shorts for summer? Heck YES! Hallie is totally rocking these babies with a lightweight chiffon top and some major wedges! 4. Taylor of Curly in the City: Who doesn’t love an airy tunic style dress? You could pretty much wear this any day and feel uber comfy, all while looking oh-so-chic!